Is Corky Suitable for Release? In 1969, a young female killer whale was captured in British Columbia from the Northern Resident A5 pod. She was named Corky II, and spent the first 17 years of her life in captivity at Marineland of the Pacific. In 1986, she was transferred to SeaWorld San Diego, where she has remained since. Corky is now estimated to be around 50 years old. For years, many activists have been calling for Corky's release. She even has a "freedom banner," a huge quilt made of material donated in honor of Corky's freedom. Scientists like Dr. Paul Spong and Alexandra Morton, as well as organizations such as PETA, HSUS, and WDC also wish Corky to be released. Despite good intentions, this plan is simply not in Corky's best interest. It would not benefit her welfare; in fact, it would do quite the opposite. I would like to discuss Corky's release plan, why many activists want her released, and why this is not humane or realistic. The release plan is to move Corky from SWSD to a sea pen in British Columbia. Once in her native waters, she would be rehabilitated; taught to catch live fish, exercised into top physical shape, etc. Once rehabilitated, she would – if at all possible – be released. If she was deemed unreleasable, she would live out the rest of her days in the sea pen. There are numerous reasons why many people want Corky to be released. One of the most obvious reasons is that they are against having killer whales in human care. They believe that Corky is a good candidate for release. Other reasons are often related to what Corky "deserves." She had a rough life at Marineland, with the death of her calves and being kept in a poor environment. Many people believe that she has a bad life at SeaWorld, simply because they feel that keeping orcas in a zoological setting is inherently cruel, and thus Corky must be "suffering." They believe that Corky deserves to be retired due to this. Corky is also the oldest orca in captivity, and also the longest captive whale. Many activists state this emotionally, using it as a reason why Corky deserves to be freed. Some even say that she is the industry's longest serving prisoner, when she did no crime; and thus deserves to be freed. Other arguments are similarly emotional. Corky conceived seven calves at Marineland, and none of them survived more than two months. She lived in dismal conditions with her companion, a large bull named Orky II who shared her Northern Resident heritage. The small pools also contributed to the death of her calves. When born alive, they were unable to nurse properly due to Corky constantly having to push them away from the walls of the tank. These arguments are sometimes used to gain empathy, and once again ties back to how Corky deserves to retire after such a difficult life. Another very common argument is that Corky "remembers her family." In 1993, some reporters from ABC played A5 calls for Corky. All of the whales seemed interested, but Corky was affected the most; she began shuddering violently. Activists immediately took this to mean that Corky remembers her family, and if released would re-integrate with them. Indeed, one of the most common arguments is that Corky deserves to be reunited with her family. This is all very well-intentioned. However, it ultimately puts human emotions and an animal rights agenda over Corky's welfare. From a purely physical standpoint, it is unwise to move Corky. She has been captive for 46 years, meaning that she has been in a sterile environment for most of her life. There is a very real possibility that her immune system couldn't handle the germ-filled, polluted waters of the ocean; especially since she is getting fairly old. She also has very worn teeth, which could potentially cause problems. However, wild killer whales do have worn teeth, so this may not hinder her ability to survive. Another issue is that sea pens are dangerous in that there are foreign objects that Corky could ingest. Nami, a female orca who lived in Japan, was moved to a sea pen and died after ingesting 180 lbs of rocks. There are also many social issues with this plan. To be released, Corky would first have to be separated from her current pod and environment. While she never had any surviving calves of her own, she has been the surrogate mother of several. She still lives with Orkid, her adopted daughter; Corky has been caring for Orkid since her mother's death when she was only 11 months old. The two are extremely close. However, Orkid is a Northern Resident (through father Orky II) X Icelandic (through mother Kandu V) hybrid that was born in captivity. Not only does her captive-bred status affect how feasible any release for her would be, but her hybridization deems her 100% unreleasable. It is completely irresponsible to allow an unnatural hybrid the chance to breed with wild whales. 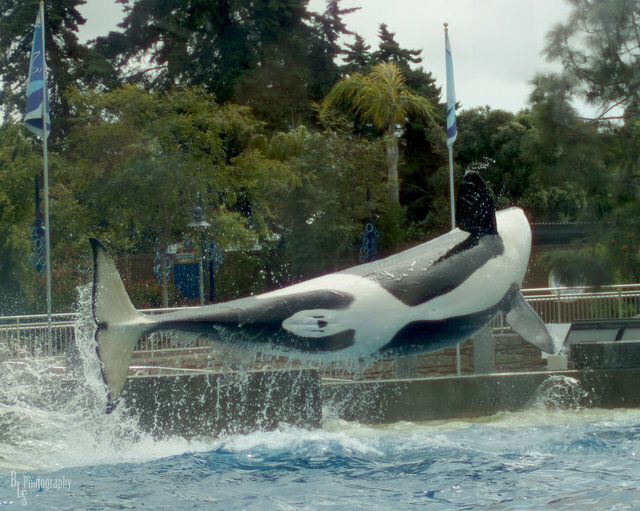 So, for Corky to be released, she would have to leave Orkid behind – as well as the rest of her pod. This is the kind of separation that is such a hated part of capturing wild orcas. At this, activists may point out that Corky remembers her family – citing the ABC video. However, there are a few crucial issues regarding this. Firstly and most obviously, we really don't know what Corky does or does not remember. Maybe she was reacting more to the fact that the calls were in her own dialect, rather than "remembering" specific individuals. Especially since it had been 24 years since her capture, so there were likely some individuals calling that Corky had never even met. But, let's say that Corky did recognize, remember, and maybe even miss, whatever individuals she had known that were calling in the recording. It has been 46 years since Corky was captured. In that time, Corky's mother (A23 "Stripe") has died – in fact, she has been dead for 15 years. From the information I have found, there isn't a single whale in the A5 pod that was born before 1969, meaning that none of the orcas in Corky's natal pod have ever even met her. There are whales within the larger Northern Resident community that she may have known, but the original whales of her natal pod – the ones she knew as a calf, the ones she would have remembered most – are dead. She does have siblings in A5, but she has never met them. Not a single whale in the modern pod knows Corky, and nor does Corky know them. Even if there are orcas within the community that she knows, she only ever knew them for three or four years. I understand that she would have long-lasting bonds with her immediate family pod, but how well would she remember other residents? Meanwhile, she has lived with animals like Kasatka, Orkid, etc. for decades. As I said earlier, we can't know how Corky feels. But is it more likely that she would prefer to be removed from her pod, to go find a completely new A5 pod – no Stripe, no Eve, no Top Notch – or could she maybe prefer to live with her own adopted daughter, and the other whales that she has known for years? Another thing that we don't know is whether or not Corky would integrate into wild pods. We know that Keiko never really did (although this may have something to do with Icelandic social structure, which is something that the long-captive, isolated Keiko knew nothing about). In fact, Keiko consistently displayed his desire for human companionship. Corky is a very sweet, gentle whale who has very strong relationships with her human trainers. If any whale had the potential to take human affection over interaction with strange whales, it's Corky. We can never know for sure unless we try, but is it really worth all these risks? There is a possibility that Corky wouldn't be released, but would spend the rest of her days in a sea pen. This is less risky than a full-out release, but it would still mean separation from the pod that she knows now. Dr. Spong, PETA, etc. do show interest in retiring all of SeaWorld's orcas, but are really pushing for Corky's retirement. That means that there is a chance of separation. Plus, it would be best to retire the animals to their respective natural habitats (Corky to BC, everyone else to Iceland). This means that Corky would be separated from most of her pod, even if they allowed Orkid to retire in BC with her (since she is 50% NR). The safety risks and issues with social structure are hard to justify. This is something that we should really think about. Why would we risk Corky's health, separate her from her current and well-established pod, and dump her into an ocean full of unfamiliar whales? The only real benefit would be that Corky gets more space. But is more space really necessary to improve her welfare? Besides, SeaWorld is hoping to considerably expand their own exhibits – so Corky will be getting more space. And let's not forget that Keiko's sea pen was shallower than a SeaWorld pool and had much less space than the entire system of tanks that they have. The larger bay pen is bigger, but we don't know if orcas really need that. In fact, Keiko had to be trained to leave his pen, as he liked the smaller space just fine. So the only feasible welfare benefit is more space, which seems a bit unnecessary – the cons outweigh that one pro. So why do so many people want Corky to be released? At the end of all this, Corky's release plan is a human feel-good project. We all love the idea of Corky being freed and reuniting with her family. But even a sea pen could kill her, much less release, and the only members of her immediate family that she might remember are all dead. This is an instance of humans putting their emotions over the welfare of an animal. I believe that the killer whale scientists and activists are putting their idealistic ideas and emotions over Corky's actual needs. I respect them very much as scientists, but they are turning a blind eye to blatant facts with this issue. They are also misleading the public by saying things like "Corky can be reunited with her family." The only family that Corky has left are whales that she has never met. She is with her true family, in the social structure that she has successfully adapted to. It is in Corky's best interest to remain where she is, in loving human care, surrounded by her pod and dedicated caretakers. If anyone is interested in actually furthering Corky's welfare, I would suggest supporting SeaWorld's Blue World Project. The project includes larger and more naturalistic exhibits – the perks of sea pens, without the dangers. Photo features Corky II. Please Note: The author has permission to use this photo. No one, besides the author, may use it in any way.